Our excellent all-volunteer choir is a central part of worship at our 11:00AM Sunday service, and at Christmas and Holy Week services. 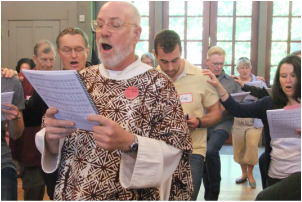 All our music is sung a cappella, usually in four-part harmony, and the whole congregation sings throughout the liturgy; the choir provides strong vocal leadership and leads harmony parts. At the 11:00 AM service the choir opens the service by singing an anthem, then sits among the congregation during the first part of the service, singing strongly and helping carry the music. As the congregation gathers to stand around the altar, choir members reassemble as a group to sing anthems for communion and collection. They disperse among the congregation again to help everyone sing and dance the final carol. Listen to our choir here, and read more about music at St. Gregory's. Contact us for more information about the choir. 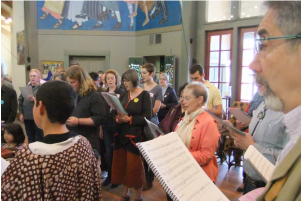 Choir practice is held every Thursday (every other Thursday in the summer) from 7:30PM - 9:30 PM. There is no audition, and all musical abilities are welcome. 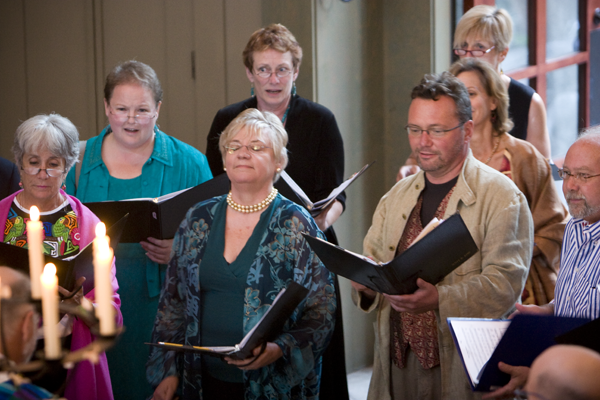 The choir is always looking for people who enjoy singing together, and welcomes newcomers. The Choir also warms up and rehearses on Sunday mornings at 10:35 AM, before the late service. Every Sunday, the choir sings a prelude before the service, and two pieces during the liturgy. The choir's repertoire spans all musical traditions and eras. Sanford Dole has been music director at St. Gregory’s since 1993. Starting with four stalwart individuals that first year, Sanford has developed a thriving community of singers. His own compositions are part of St. Gregory's musical repertoire.